Jacqueline Marie (Flachbarth) Dickinson passed away peacefully at the Horizon House in Anchorage, Alaska January 14th, 2019 at the age of 89. Her daughter Jenny, Pastor Emily from St. John United Methodist Church and long-time family friend Marion Bowles were by her side. Jackie was born in Parma, Ohio on January 26, 1929 to Frank and Marie Flachbarth. She graduated from West Technical High School in Cleveland, Ohio, then received an undergraduate degree from Ohio State University followed by receiving a master’s degree in psychology from Kent State University. 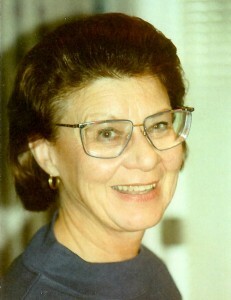 She worked in Bedford, Ohio as a School Psychologist and traveled to Alaska in 1955 for a medical conference where she met Lewis Dickinson. They fell in love and were married on February 24, 1956 and honeymooned in Fairbanks. Jackie worked for 17 years as a Clinical Psychologist with the Alaska Treatment Center (ACCA) in Anchorage. While there, Jackie was part of a comprehensive team of professionals that worked together to recommend care for children with disabilities. Jackie later dedicated herself to her and Lew’s two children, Luke and Jenny. She was an accomplished homemaker and relentless driver to hockey, figure skating lessons, tennis, piano, cello, dance, and ski racing events. Jackie had a love for fashion, traveling, continuing her education, reading books on all topics and had an interest in the fine arts, especially music. She was well known for her 30 years of service as a Sunday School Teacher at St. John United Methodist Church. Jackie was a loving wife, mother, friend, but one of her favorite activities was being a cherished grandmother who tirelessly entertained and educated her two grandchildren. Jackie and Lew were married for nearly 63 years and spent recent years enjoying their winter home in Hawaii and summer get-away in Seldovia, Alaska. The real Jackie was taken away from us too soon, as she was diagnosed with Alzheimer’s the last 10 years of her life. The family would like to extend a special thanks to Jana Ripley, the staff at the Providence Horizon House and Hospice of Alaska for the expert care and comfort they provided her in her final years. Survivors include her husband, Lewis Dickinson, son Luke, Seattle, Washington, daughter Jenny Hand (Keith), and grandchildren Hailey and Carson Hand, brother Gene Flachbarth (Ellen) Atlanta, Georgia, and 6 nephews and nieces in the Lower 48. A memorial service will be held at St. John United Methodist Church on Tuesday, February 5th at 5pm followed by a celebration of life at the home of her daughter, Jenny. In lieu of flowers donations can be made in her name to the Sunday School Program at St. John United Methodist Church and to the Alzheimer’s Association of choice.